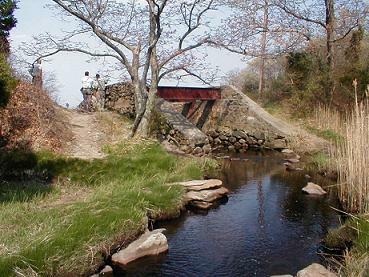 The John H. Chafee Nature Preserve shall at all times and in perpetuity be managed in a manner consistent with the terms and conditions of a conservation Easement signed by and between the State of Rhone Island, Department of Environmental Management (grantor) and the Town of North Kingston, (grantee) on March 26, 2001, and which further reflects and honors the conservations ethic of the great statesman for whom it is named. More specifically, its agricultural, educational and scenic values, and its natural and historical resources shall be preserved and protected while being made accessible to the public in a manner respectful of and consistent with these principles. Organized groups of more than ten people must first fill out a Special Use Form. They may be required to make alternative parking arrangements for their participants if the on-site parking lot is likely to be exceeded by their event. For group reservations, patrons should call Goddard Memorial State Park. Pedestrians, bicyclists, and equestrians are permitted. There are no campfires permitted in the nature preserve. No harassment of wildlife by visitors or their pets is permitted. Hunting, trapping, and/or the carrying of firearms is prohibited. No unauthorized motor vehicles are permitted beyond the locked gate at the Boston Neck road trail head.